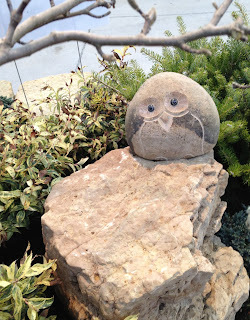 Who is going to the Indiana Flower & Patio Show or your own local outdoor living - flower - garden show? 'Tis the season for various shows like this to pop up across the country. They vary on the "gardening" spectrum as to how much gardening is included, from little to some. That's okay. A gardener like me who pretty much thinks about gardening all the time doesn't expect that the entire show is geared toward gardening. Which is good because our show is an "outdoor living" show. There are plenty of ideas for patio sitting, outdoor cooking, and outdoor playing . The plants in some - most - displays often seem like more of a backdrop. But mixed in are some good ideas for gardeners,enough to shake away the winter blues and get you thinking about spring and summer and gardening outside again. 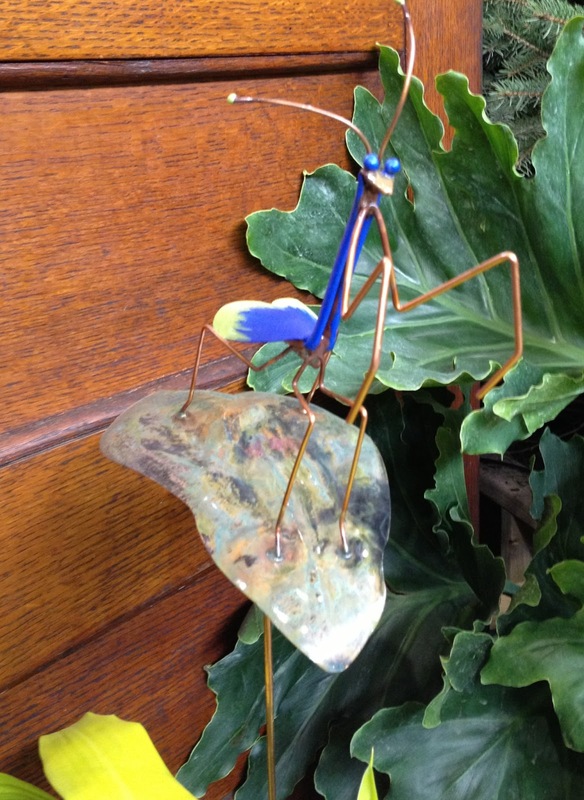 I really liked this sculpture by the same artist who made the sculpture I have in my garden. 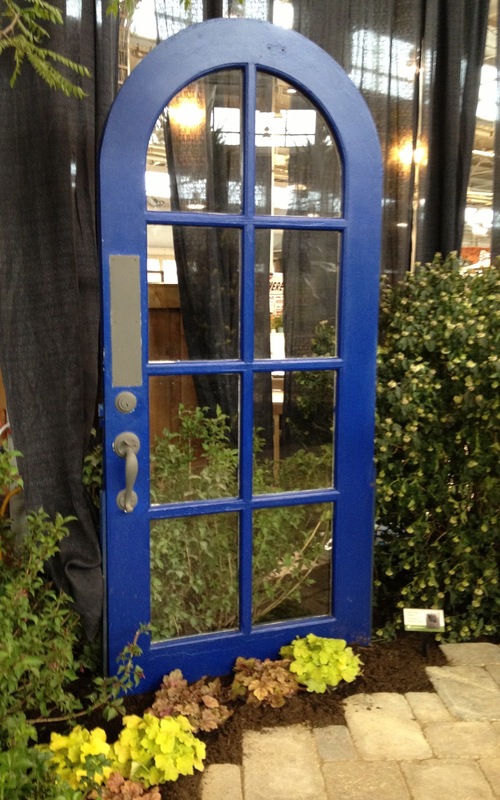 I like the idea of doors in the garden and have long thought about getting some old doors for my garden. When I see blue hydrangeas, I usually think "how nice", but it's hard to make a hydrangea turn blue in my garden. 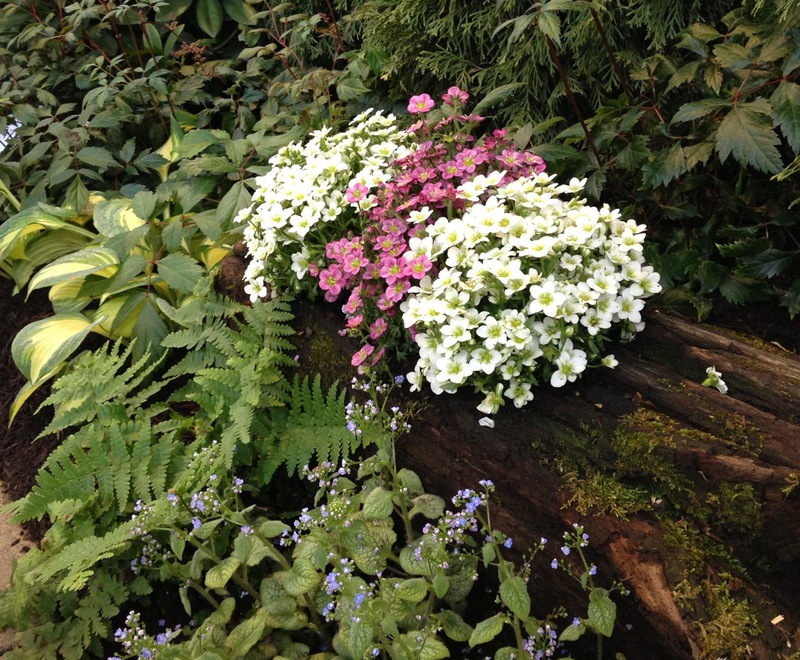 I do love a good vignette in a garden, and thought this one with blue Brunnera and other flowers planted in a rotting log was sweet. Even the praying mantis had it's blue on at the show. I used to take notice if there were blooms or plant combinations at the show that were not likely to occur in an Indiana garden, but now I'm just happy to see something growing, like these agaves, which by the way, are not suitable for an Indiana garden. 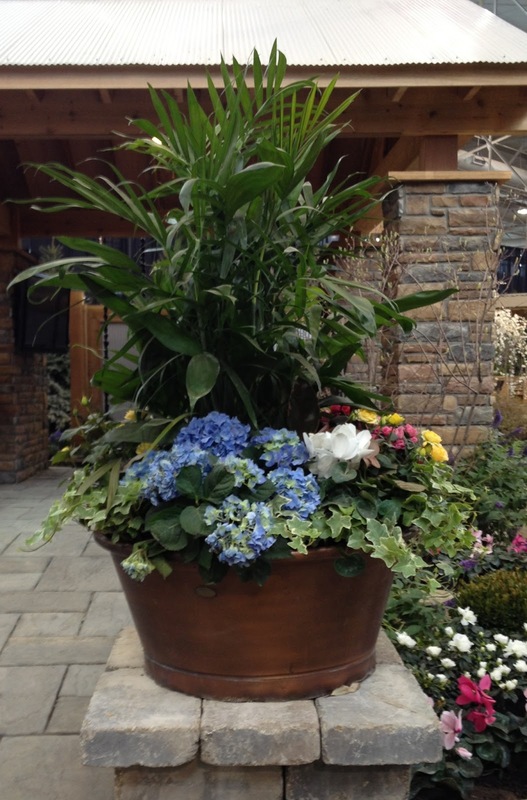 Going to the Indiana Flower and Patio show is one of the rituals of the season, one of the first activities of spring gardening for many of us. 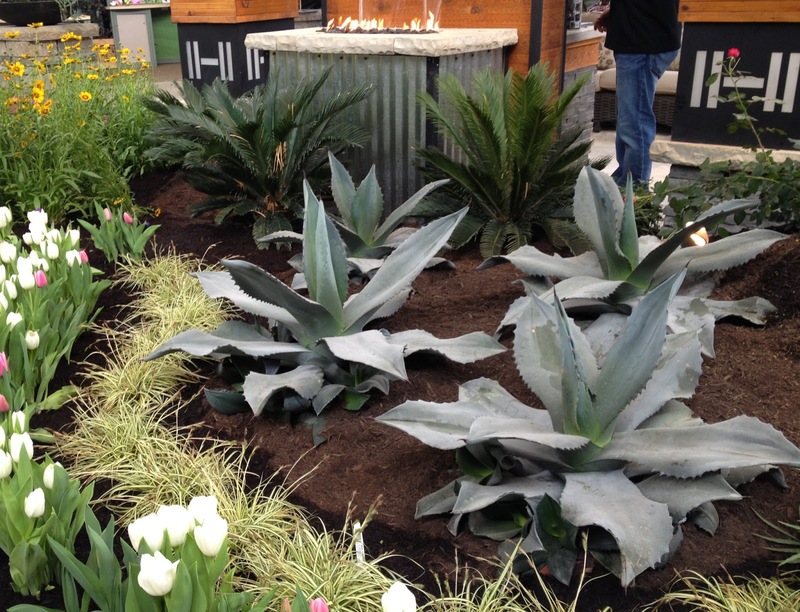 We smell the mulch, see the flowers, and dream of our own gardens. 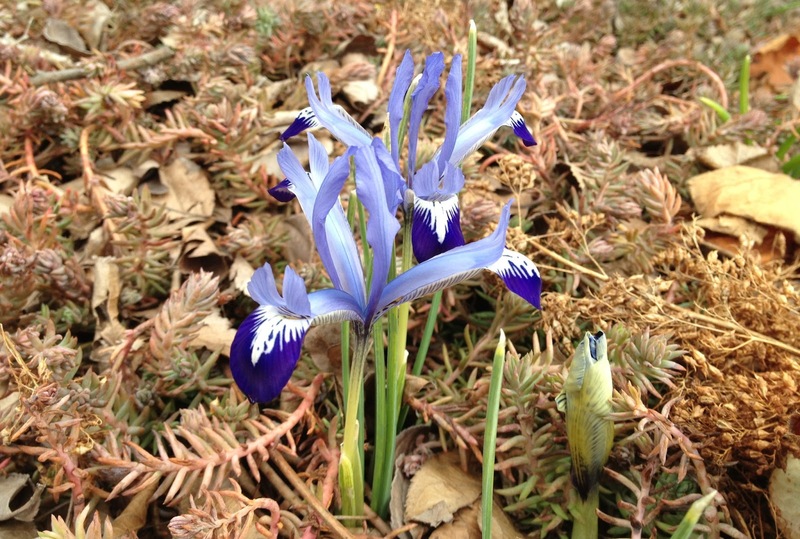 Then we come home and find that our own flowers are beginning to bloom, like this Iris reticulata. And we are excited that once again, the growing season is near. 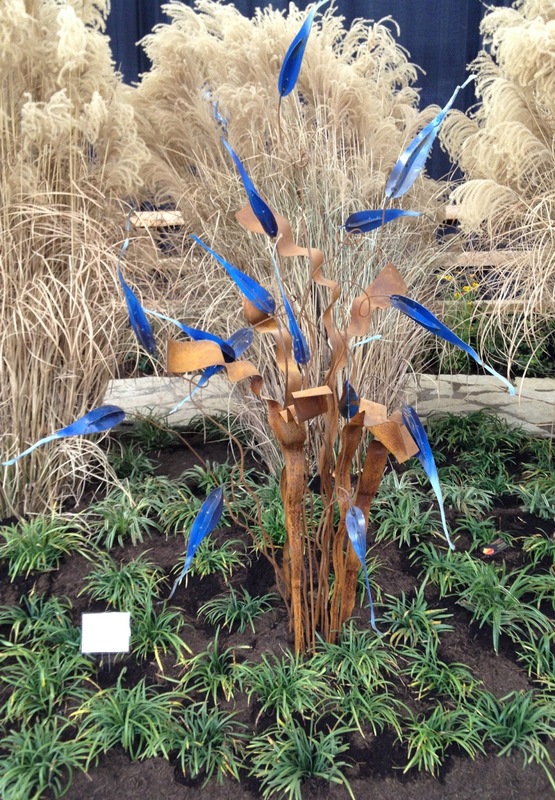 Time to shake the winter blues and look for clear blue skies and blue flowers ahead. If you go to the Indiana Flower & Patio show, be sure and go through to the second building. That's where you'll find booths chickens, Master Gardeners who can answer your gardening questions, the Indiana Native Plant and Wildflower Society's (INPAWS), and Indiana Gardening magazine. 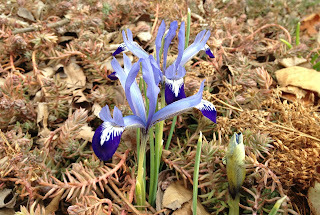 Your Iris Reticulata is blooming??? Wow. Mine are just putting up some green. Looks like the show was full of inspiration. Beckie and I went to the Indy show last year and really enjoyed it, but this year we're headed to the Chicago show instead, leaving tomorrow. 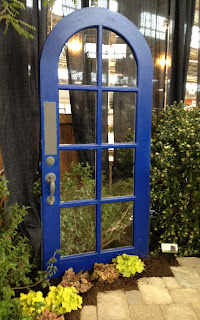 I'm definitely ready for some garden inspiration and seeing something other than brown and gray in a garden:) Love that blue door!! I've just sown the seeds of blue forget me not in my garden. 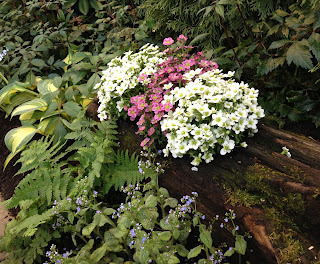 I hope it looks as pretty as the clump growing by the rotting log.